Connections are a good thing to have. It took me some time to get into the system, to figure out how the ticket buying and membership-ing all works, but once you do (assuming you can read Chinese), it’s not hard to navigate through the system and buy tickets online and get seats for your friend next to (or close to) where you’re sitting for a show. But despite the familiarity with the systems, my subscriptions, my season ticket buying for the local ensembles, there are still concerts that I overlook, and Sun d was one of them. I get the monthly program of events at the concert hall and opera house and flip through it to see what else might be of interest (even though I’ve already bought tickets to the bigger events there that I’m interested in), and this event was one of a small series that I managed to overlook. It was only through a friend’s inquiry that I knew of this series of concerts and lectures, and even though I originally thought this one was on a Saturday, I still made it on Sunday and was glad I did. The program was an interesting one, made up of some very small pieces, and some significantly larger ones, relatively speaking. I was glad to see Zemlinsky included in what the performers called “this Second Viennese School program,” and the trio is a work I’m unfamiliar with. That being said, I’m sure the cello was meant to be audible… and at many points it wasn’t. The pianist was clearly very much at home with even the most modern of works on the program, but I felt the piano to be a bit heavy-handed in the mix. It’s a work I’d like to hear a few more times, as I’ve really enjoyed his other chamber works. After the trio, one of the biggest works on the program, they came out and Oliver Schwartz, clarinet, thanks us for the applause and future applause but asks us to respect their wishes to perform the remaining pieces of the first half of the program (Schoenberg through to Webern) as a suite, without a break. This was a wonderful experience. 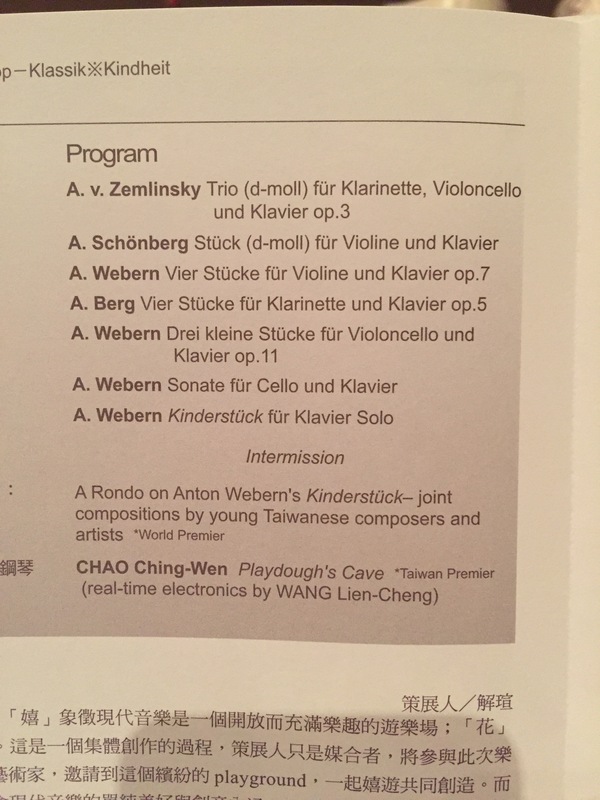 I showed the above picture to a musician friend and he said “I’ve never seen so much Webern on a program.” True… that’s four Weberns on a program but in total, it was still only a few minutes of music. The most impressive thing about the entire collection played as a suite is to put these tiny little pieces in a context. It is rare to hear works like this because unless you have a full program of violin and piano, or solo piano, or solo clarinet, it’s not easy to work such small things in, but the pieces came and went, with the violin, then clarinet, cello, then solo piano, a wonderful progression of intimate, intense, extremely personal and powerful music. I think also this is music that’s critical to be heard live. It might sound a bit hinky until you’ve experienced it, but there’s a spatial element to these pieces, and while we’re so fortunate to have the technology to access these pieces from our phones or YouTube or CDs or whatever, it still puts us at some remove from the music itself. Sitting in a hall listening to the intense sparseness of Webern, the notes, as bare and naked as they are, what might seem otherwise like noisy clanking, become tactile, physical gestures, they hang palpably in the air, and I get the sense that this music lives and breathes and must be heard live, that it’s as intensely powerful and consuming as something completely opposite in size and scope as a Mahler symphony, and the connection of the pieces as a suite kept the audience from breaking that atmosphere, from removing a certain fourth wall, so that the next piece, or part of each piece, was like another layer of paint, another color or brushstroke in the almost-full recital hall. Brilliant. Everyone had a few minutes to breathe during the intermission, and it marked a turning point in the program, as I suppose it normally should. After having constructed the beehive or birds nest of Viennese music that hung in the air before the intermission, the second half was more like a fantasy inspired by the music that was still on everyone’s palates. The rondo on Webern’s Kinderstück was a very interesting piece, illustrating the potential that such seemingly simplistic pieces have, what musical ideas are represented and what can be done with them even if they aren’t developed in that piece. The work showed more a youthful talent and trueness to the original content than some wild, super individual style, which I was completely okay with. It was wonderful to see a half dozen very young Taiwanese composers working from material that they clearly held in high regard. The final piece on the program was the most challenging for me. Composed by 趙菁文, former student of Brian Ferneyhough, she also spent some time in Cologne, I think, it was apparent in the work, which I have no criticisms of except for that it isn’t really my style. I may not be familiar enough with these composers to make associations, but I’d say it isn’t surprising that the composer studied won perhaps the preeminent composer of “The New Complexity.” It also called to mind the performances of works by Donatoni and Grisey from last year’s Ensemble Intercontemporain concert. It featured electronics and the instrumentalists playing not only their own instruments (piano, cello, violin, clarinet) but responsible for an assortment of bells, chimes, tops and other spiny, clanky, clicky things, with regular “whoosh” mouth noises. It was far too long for t attention span but had some undeniably interesting and memorable moments. It’s just not music I know how to listen to. That being said, it was very encouraging to see a recital hall full of all types of people, not just students but adults and even old people, all seemingly very excited to be there, appreciative, and with varying levels of interest or curiosity about the music. I’d recently been discussing the paucity of local chamber music, and it seems NOT to be due to lack of interest, if Webern and Berg and Schoenberg can fill a recital hall. Good to see, and I was glad I was able to attend. See you next time.